Whether you love food on a stick or a salad from the Waldorf, this show has something for you. Down-home laughs and big city music! These trailer park singing sensations have a great many stories to tell, taking us on one sidesplitting ride of comedy and audience interaction. Audiences spend an evening wowed by veteran singers showcasing songs ranging from Gospel and Country to Broadway, Pop, and Classical. 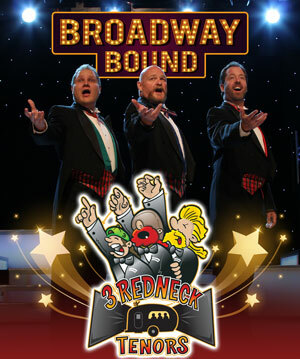 These guys have been seen as top 10 finalists on America’s Got Talent, on Larry The Cable Guy’s History Channel Show Only in America, and live in theaters across the nation. Matthew Lord is a native of California. He is recognized as a versatile performing artist whose stage work is consistently praised for its naturalness, intensity, and commitment. Mr. Lord also has performed with almost every major opera house in the U.S., and made his New York Metropolitan Opera debut in January 2004 in Boris Godunov, and also performed in Andrew Lloyd Weber’s Phantom of the Opera as Piangi in the Hamburg Germany production. He is a graduate of the prestigious Julliard Opera Center. Blake Davidson is an award-winning singer who has performed all over the world, and whose range of experience includes opera, symphony, and musical theatre. He has been presented in solo concerts at NYU, Lincoln Center, Carnegie Hall, and the Tokyo Opera House. Mr. Davidson has sung with the Anchorage Opera and the Dallas Opera, and is a featured soloist on the Dallas Symphony’s Christmas CD. Early in his career he was seen off-Broadway at 2nd Stage, and as the ringmaster for the Shrine circus. Jonathan Frugé holds a Bachelor of Arts degree in Music Performance and his Masters of Music in Vocal Performance from Texas Tech University. His credits include choral performances and soloist appearances at Carnegie Hall with the New York City Chamber Orchestra, Walt Disney Concert Hall, among many others. Before joining 3 Redneck Tenors, Jonathan was a highly sought-after stage performer having over 20 leading roles to his credit including Col. Hugh Pickering in My Fair Lady, Jinx in Forever Plaid, 3 original premiers and 4 regional tours.